Length (heel to toe)-9.75". Shoes are in excellent condition. Insoles-9.5". Toe of right shoe shows a few very small, very faint scuffs. Outside of right shoe also shows small light colored mark near inner arch area. Toe of left shoe shows very small, faint, light colored mark. Shoes have a hidden wedge for a modern look. would easily fir a 7.5 size. Bottom soles are slightly dirty but tread is not worn down. Insoles and inner linings are slightly dirty. Sides of shoes are slightly dirty. Length (Heel to Toe): 10.25". Width: 3.5". Women’s Classic Slip On Shoes Toms Size: 7W Black Glitter These are in good used condition. They have been worn please see pictures. Thanks for looking! If you have any questions please feel free to ask and I’ll do my best to answer them for you! Style: Ashland Lane. Bottom construction: Ashland. From Clarks Bendables. Brown Suede/Navy Suede: water-resistant. They look as good as they feel. Two-button detail and allover contrast stitching add stylish interest to the rich tumbled leather. Good condition. Has some signs of wear see pics. Shipped within one business day. They are in really nice condition - nice leather ties closed these shoes. perfect for walking distances. Shoes are in very good previously used condition. Wendy Willams Collection Black Espidrille Shoes Size 7M. Shipped with USPS Priority Mail. Shoes are in great condition. Light dirt on the bottoms and insoles. 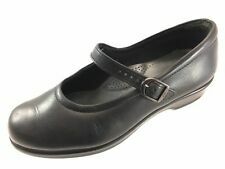 Heel: Appearance of flats, but these shoes have a. Insole: 9.25". Black lace up suede Monro shoes. Pre-owned in good condition. Shoes are pre-owned with normal wear. There are light scuff marks on the toes, along the sides, and back heels. Bottom soles are dirty from previous wear. Bottom Sole Length: 10.25". Insole Length: 9.75". Style: Loafers. Dress & Formal. Fashion Sneakers. Toe Style: Round Toe. Save up to 90% on the. Heel Height: 0.5. Material: Leather. Closure Type: Slip On.